The welcome mat is always rolled out in Northern Indiana. Whether you’re searching for beachside fun, a campus tour, some time to unwind, arts and antiques, or Amish cooking—you’ll find easy access, great accommodations, top-notch restaurants, and more along our main routes. Start planning your adventure in Indiana’s Cool North with our interactive map. The Indiana Toll Road provides easy access to the north of the region. 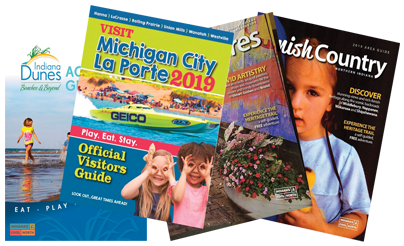 Traveling from the west, you’ll pass by the shores of Lake Michigan and the Indiana Dunes near Chesterton and Michigan City, the legendary University of Notre Dame in South Bend, and Amish communities in Nappanee, Middlebury, and Shipshewana. The drive time between any of these great experiences is less than 1.5 hours.